Coyote Hill thrives from the generous support our community provides. Consistent monthly donations are what keep utilities running, fast-growing children well clothed, and pantries full of nutritious food. 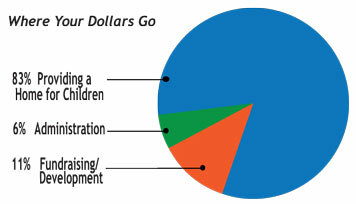 The majority of the funds used to care for children at Coyote Hill come from regular donations of modest amounts. We encourage you to take a moment to read just a few of the reasons why our donors choose to support Coyote Hill. Parent Partners are those individuals or businesses that support us on a monthly basis. This is very important for the financial stability of our work with the children and their families. Most of us are not wealthy, but we still want to help, and our contributions ABSOLUTELY add up to changed lives of abused and neglected children. If you can’t afford $25 or $50 per month, then do $5 or $10. What ever your gift, if you are committing to a once a month donation, you are becoming a Parent Partner. You can make it easy with a secure online contribution using our online donation form. Or, you can mail your contribution to us at P.O. Box 1, Harrisburg, MO 65256. All contributions to Coyote Hill are tax deductible. We are 501(c)3. For further questions about contributions, call or email Kim at our office.